In India as in many parts of South Asia, refractionist this is the time of the New Year. This is the time when the northward transition of the Sun from Dhanu rashi (Sagittarius) to Makara rashi (Capricorn) takes place. Known as Makara Sankranti – the harvest festival – it is a time that marks the ending of winter and the beginning of spring. A very auspicious time in the Hindu calendar as it is the beginning of a New Year. With this, pills I’d like to take the opportunity to launch my new website and blog wherein one can find answers to many questions and get a peep into the behind the scenes of Wildlife filmmaking and photography. The website is still under-construction so check back frequently for more updates and features. 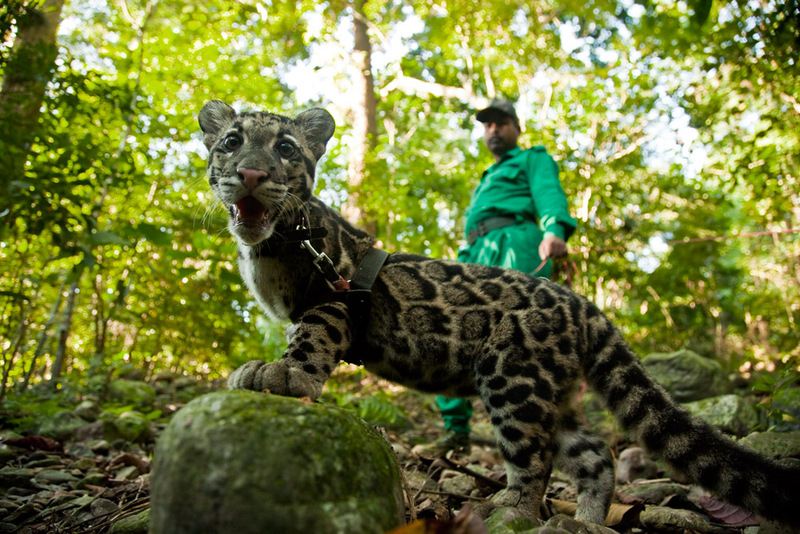 The first photo-essay on the blog page is about my work with clouded leopards for an upcoming documentary. 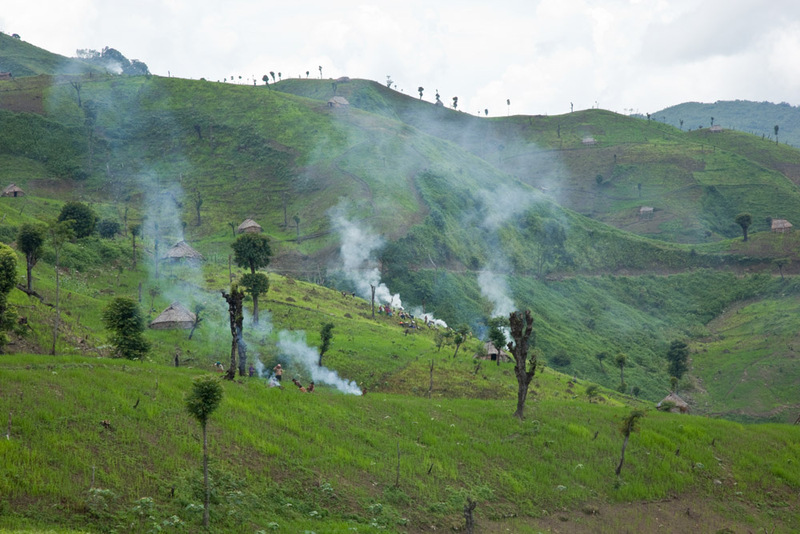 In 2009 a dream project shifted my base camp to North-Eastern India. My job was simple albeit a bit broad – document the natural and cultural treasures of the Eastern Himalaya. One of my target species of course, this site was the clouded leopard. I knew my chances of seeing one was practically non-existent, but just knowing that somewhere in the jungles around me this cat prowls was enough to keep me excited and look for signs of its possible presence. I traveled all along the foothill forests of the Himalaya and although local people knew of the clouded leopard, finding one was nearly impossible. Found through much of the forested regions of Southeast Asia, clouded leopards range from sea level up to about 2000 meters plus in the Himalaya. With increased pressure on land clouded leopards numbers are declining. They are listed as Vulnerable in the IUCN Redlist with an estimated population of less than ten thousand individuals – a guesstimate at best. The few animals that persist in human dominated landscape don’t survive for long. 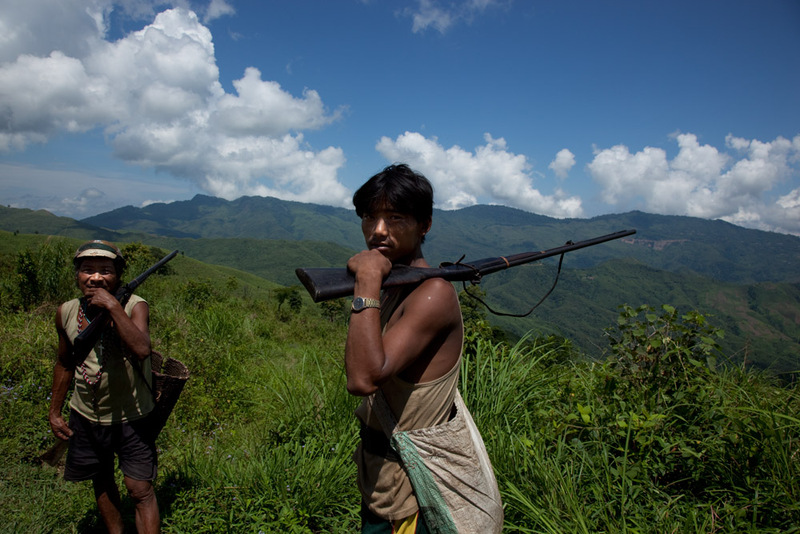 In most parts of Arunachal Pradesh and Nagaland men carry rifles as part of their everyday attire. They shoot whatever they come across that is sizeable enough to be eaten including clouded leopards. My first sign of the presence of these cats came at a market place in Arunachal Pradesh. 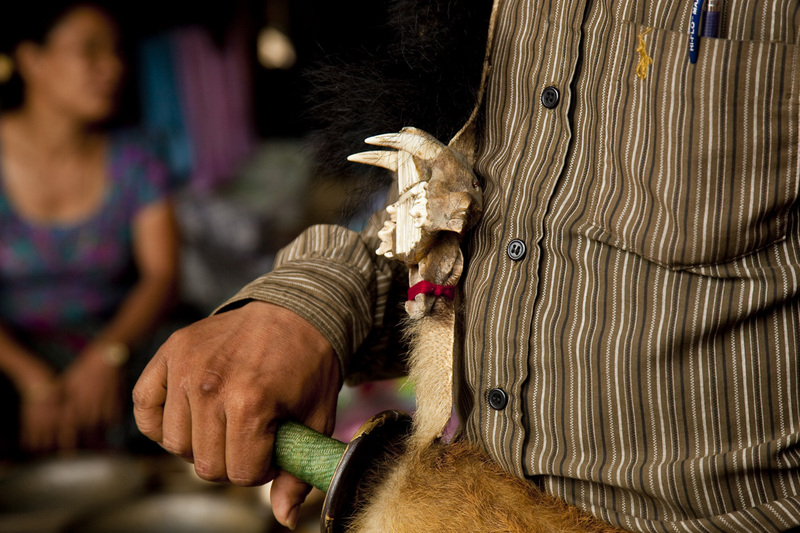 Here a clouded leopard skull adorns the sword, or Dhaow worn by the local headman’s son. A few weeks later I stopped at a government run handicraft shop (not disclosing location). I was shocked to find a colourful stone, studded clouded leopard lower jaw adorning a Dhaow being sold for 3000 Rupees – about 60 US dollars. 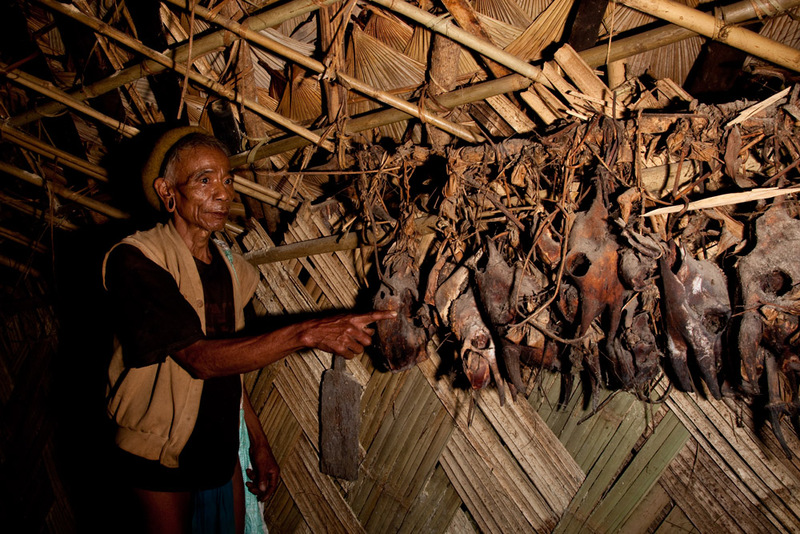 Skins and skulls of various rarely seen species are part of common decor in the kitchens’ of many Naga tribes – the best place to do a faunal biodiversity inventory. In fact a new species of leaf deer unknown to India, or to science was found rummaging through these dusty collections of old skulls and bones. 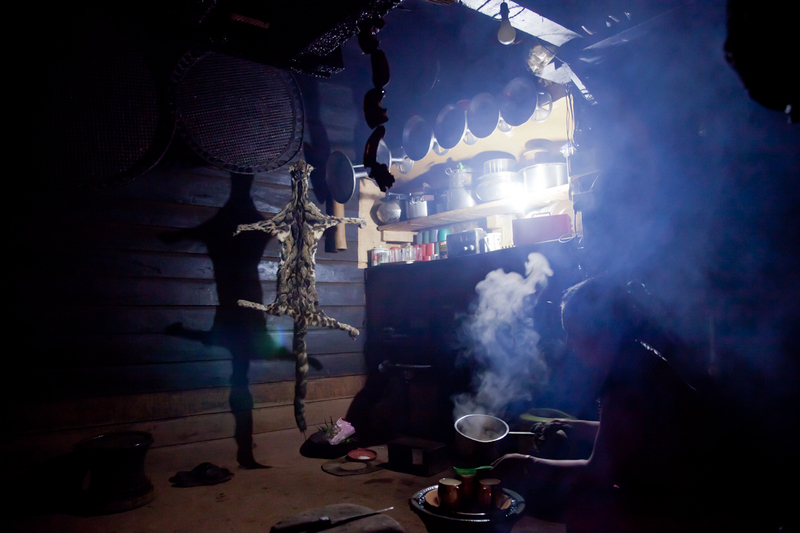 A full-grown clouded leopard coat hangs inside a Naga kitchen. It was shot during the obligatory ‘no-hunting season’ by the village headman of Zipu village near Shatuza on the Indo-Myanmar border. All in all, this was the closest I got to seeing a clouded leopard – a smelly skin of a clouded leopard shot just because it happened to be walking on the trail while the headman was on his way to work on his field. Panjit the vet at Wildlife Trust of India’s center for wildlife rescue in Kokrajhar was assigned the duty of looking after these cubs hardly a few days old. The cubs were confiscated by Sonali Ghosh who was the DFO in charge of the area and wanted to figure out a way to get the cubs back into the wild. I heard about this six to seven months later and thought that it would make a wonderful story as it was the closest I was getting to seeing a clouded leopard in the wild. So I rushed to the area and began documenting the process of rehabilitation. Initially the cubs were led on a long leash to get them used to their new home – the forested foothills of the Bhutan Himalaya. I followed these cubs living with them everyday while the cubs explored their forest surroundings. It’s amazing how quickly their cat instincts kicked in and before long they were making their own kill of junglefowl and squirrel. Clouded leopards earn their name from the big blotches of cloud-like markings on their coat, another reason why they are hunted. 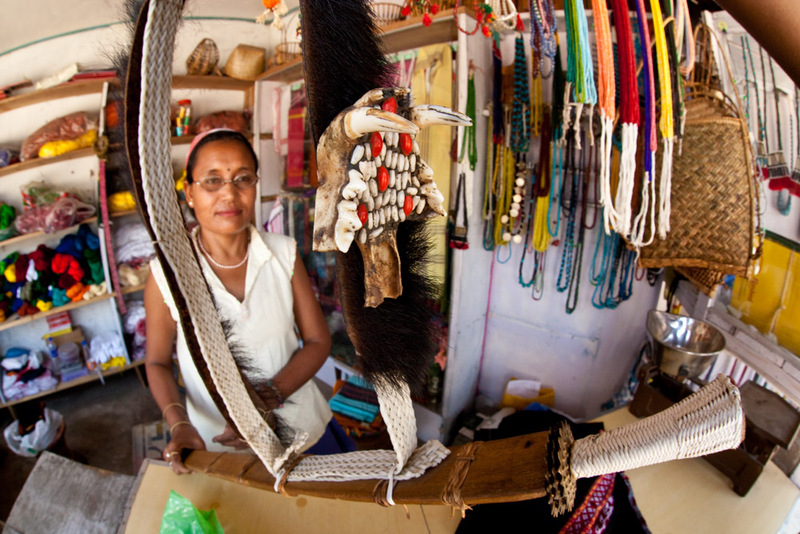 Their pelt is used to adorn sheaths, hats and other human ornaments. These cats are made for a life living in trees. They can sprint straight up a vertical tree trunk with no problem, as if running on flat ground. Their rear ankles are modified much like squirrels, so they can actually come down the trunk of a tree headfirst! Other arboreal species like golden langurs form part of the prey base of clouded leopards. For now all Runaa and Khota could do was to chase these langurs from tree to tree. 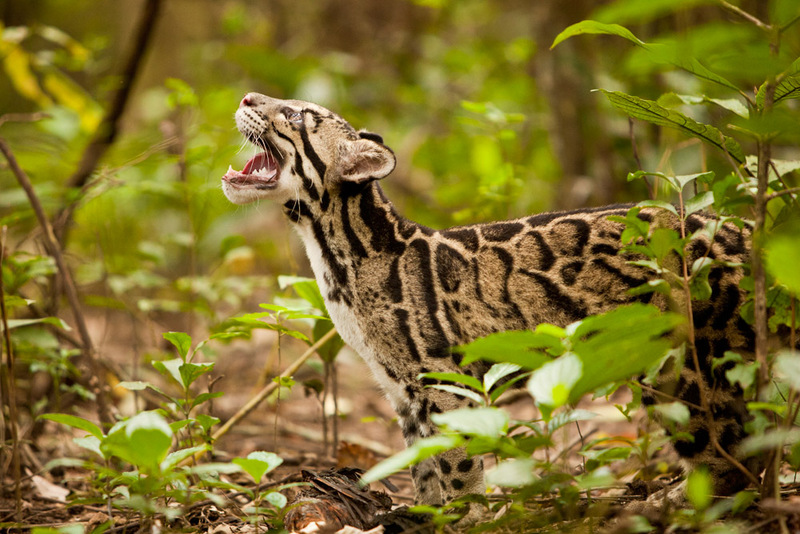 Clouded leopards can open their jaw wider than any other big cat and in relation to their skull size possess the largest canines among the Big Cat family. 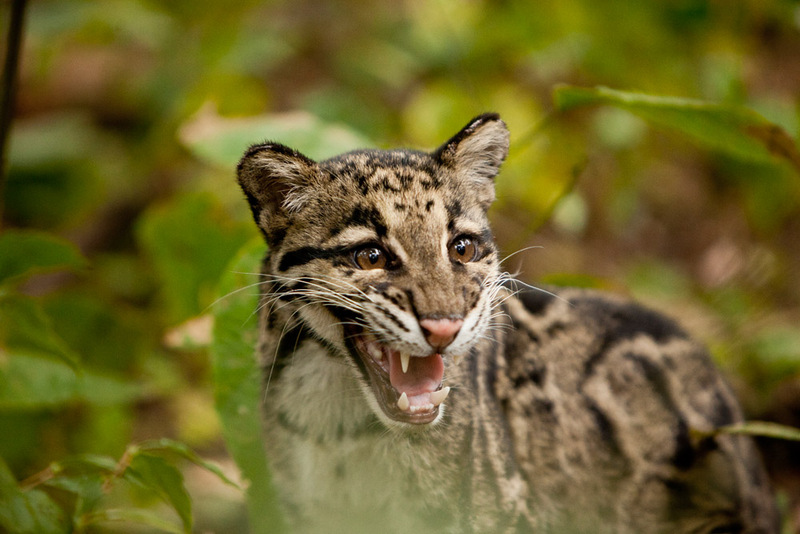 At 5 centimeters (2 inches) in length a full-grown clouded leopard’s canines are nearly the same size as a tigers’! After nearly two years we completed the documentary about Runaa and Khota. 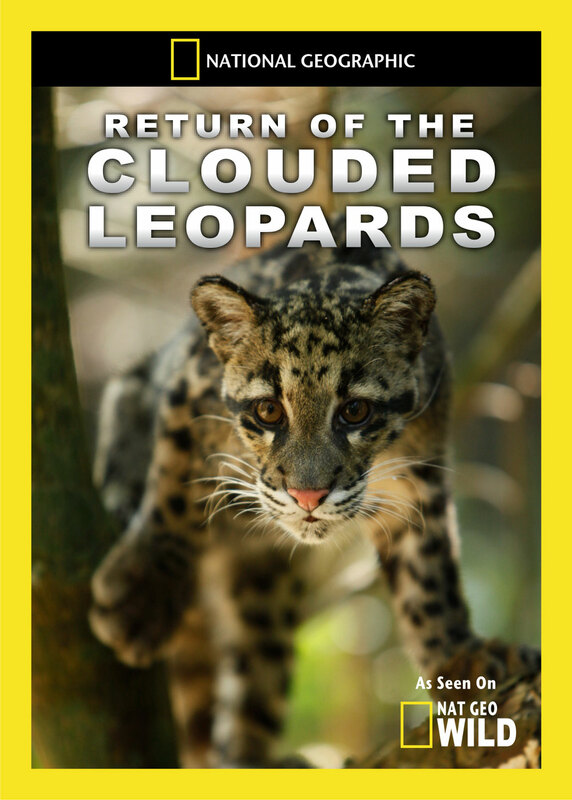 If you’d like to learn more about cloudys or how Runaa and Khotaa got along – watch Return of the Clouded Leopards on National Geographic! Here’s a short excerpt from the film which aired on National Geographic’s Big Cat week in December of 2011. You can buy a copy of the DVD here, or wait and watch it on National Geographic WILD. I don’t have word of the air date in India, but keep an eye on this space for more details. This documentary is dedicated to wildlife Vets like Panjit Basumatary and Bhaskar Choudhury. They are the animal doctors and dedicate their lives to helping animals like Runaa and Khota – no easy task. Thanks for sharing these unseen beauties. Awesome sir, worth all the effort and hope they adapt well and their legacies grow. Hi Sir.. Happy New Year to you!! and a warm wishes for your career too..
Just read ur blog and liked the pics a lot.. illustrations are very nice and easily understandable! Interested to know more about “LEAF DEER”.. any more info or pic sir? Best wishes and a salute to ur hard efforts to bring all these stories and pics to us!! Mind blowing photos…. Very happy new year…..
Best wishes for the coming year! I have been so intrigued since I saw your program on tv about the snow leopard. Your photography and work is delightful. Please keep us entertained by your work efforts. 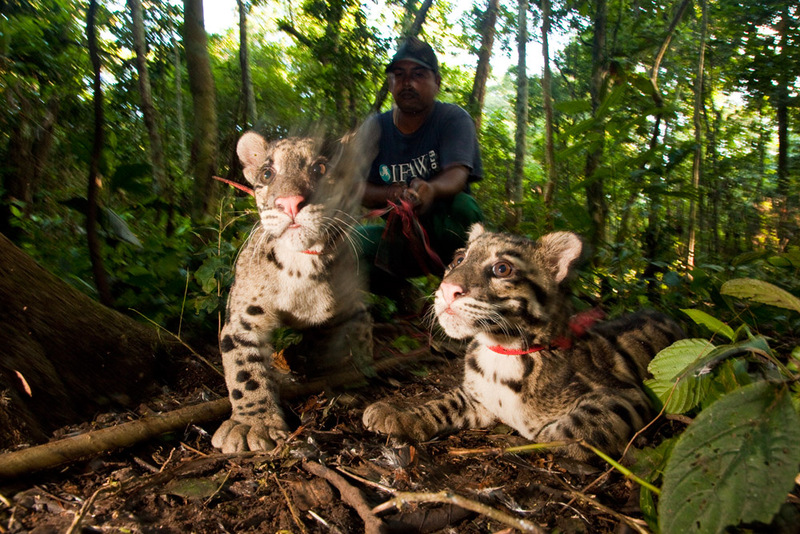 I think the clouded leopard is beautiful and hope they remain in existence. Very worthy cause, great photos and clip. A very happy new year to you too Sandesh. Look forward to seeing you this year. the story you told is amazing …..and the whole picture makes you wonder ! shots are all captivating ! please treat us with some more pics ! As always,beautiful pic & presentation.keep up the good work & best luck in everything you thing you do. Nice writeup and amazing pics. Loved reading it, will watch the documentary for sure. As always, great shots, my friend! the challenge is conservation – so that future generations can take such beautiful shots too! Thanks suku! It’s about time you started worrying about future generations! 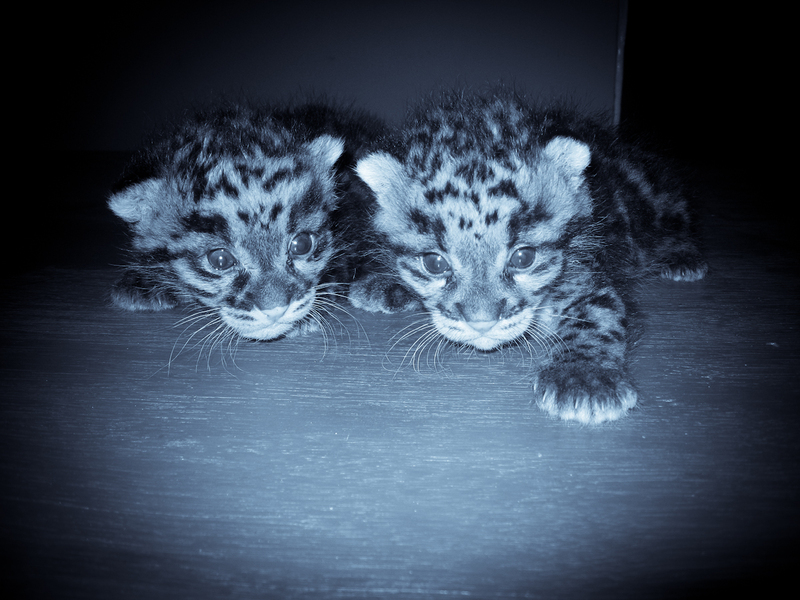 thanks for sharing the information regarding the clouded leopards…….it was great………. Hi Sandesh, these cats are so lovely! Thanks for sharing this story. Stunning images as always Sandesh. Just beautiful. And such a compelling story too. Very disturbing to learn of the commonplace leopard killings, but then again, we know how it is in villages. Sharing this gorgeous post, thanks! God, I love me them cats. Great story on the Clouded Beauties! How old is this clip? How are the Cubs faring now? Superb website too! Congrats and all the Best! Thanks Sarath – The clip/doc has only now been released. I think it launches on Feb 21st in India. I should get a dvd shortly. Cheers! I am really mesmerized. Congratulations!! A new era of nature photographer is begins, after a long hiatus in India i.e. after the famed Bedi Brothers – Congrats again!!! Just watched your documentary on the ‘Clouded Leopards’ here in NJ. It was amazing. and did not want it to stop. Great work. I would appreciate it if you could priovide an update on the first two cubs(Runna & Khota) and unfortunately forgot the names of the two new ones rescued at the end,. I hope you had success with the second set of cubs as well. Wishing you much success in all you endeavors. Sandesh, WOW! I too was mesmerized by these beautiful creatures and their stories. Beautifully done! I watched NatGeo Show on “Cluoded Leopards” yday evening. Great job and great photography. Wish you all the Best. I just saw this documentary today on Nat Geo and I must say its my pleasure that i finally found you on the web. Thanks a lot for capturing those cute wild beauties. Congrats & thanks a million for showing such a beautiful photographs of those mysteriously awesome creatures and for conservation work as well. Hi Sandesh.. Great pics. Runa & Koota. Very nice.. You are my inspiration. Sandy! This is a great story – made memorable thro’ the stunning visuals. I love the fluid story telling and the east with which you make an impact on the status in wild of these beautiful cats. I Have seen the documentary on TV . It was Amazing ..